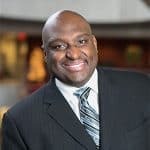 Rodney Bullard is the Executive Director of the Chick-fil-A Foundation. Prior to that, he got his law degree at Duke Law School and had a career as an attorney in the Air Force. Following a successful Air Force career, he was an Assistant US Attorney in Atlanta. It was in this position that he started on the path that would lead him to Chick-fil-A. His supervising attorney shared with him that they could not jail their community past its issues. That led to developing a number of programs to serve the community. The success he had working in the community came up in a chance opportunity to meet Dan Cathy, CEO of Chick-fil-A. Dan was so impressed by what Rodney had done at a time in his life when he was looking to see how he could be a blessing and give back to the community. He chose Rodney to lead the Foundation he was creating and the rest is history. Through a number of programs, the foundation is improving the West Side of Atlanta, which is an impoverished area of the city. They partner with other corporations and community leaders to do things like teaching leadership and financial literacy to the youth of the city. The success he’s had impacting the community has led to a system Rodney has for being a hero and he’s written a book about it called Heroes Wanted. In the book, he discusses how to be a hero starting with the 3 feet around you and your local community. Then if you have the chance, you can have an impact that spans the country or the world.